Scabiosa, sometimes called scabious flower, but more often referred to as the pincushion flower, is a group of small herbaceous annuals and perennials in the honeysuckle family. They are one of those old-fashioned, free-flowering plants right at home in a cottage garden. Pincushion flower is so named because of its rounded two-inch diameter blossoms. They are composed of short petals with tiny pin-like stamens on the dome-shaped top and frilly, elongated petals on the outside. The classic cottage garden variety is light purple, though there are pink, white, red, and blue cultivars available. The foliage grows in a tidy clump less than a foot tall and wide with the flowers rising on lanky stems above. It blooms in spring and continues until the first frost in fall - one of the many reasons to include it in a flower border. There are both perennial and annual varieties, though in extremely cold climates they are all treated as annuals. Both types are typically grown from seed started indoors about eight weeks before the last frost, though it is also possible to seed them in place. Transplant them outside once the soil is warm - they will take off quickly! Pincushion flower likes full sun, though afternoon shade is best in really hot climates. Enriching the soil with compost prior to planting will help them be healthy, lush, and full of flowers - but it's not a plant you need to fertilize to get big blossoms. 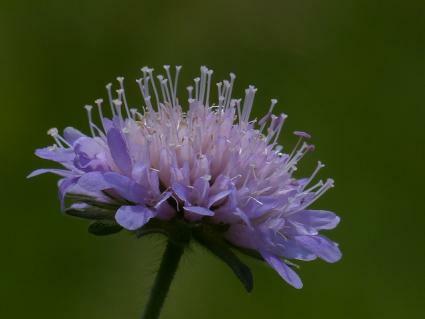 Scabiosa is a small plant, so it's best to use them in masses to prevent them from being obscured by taller species. They are ideal for informal mixed border plantings where they are often seen with butterflies swarming around their blossoms. They have neat foliage, so it is also possible to use them alone - to form a border along the edge of a path or lawn, for example. 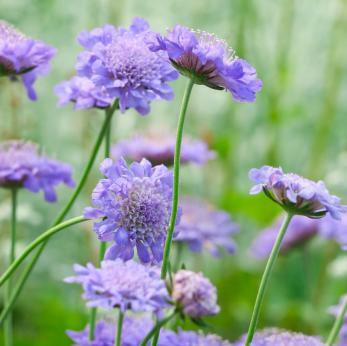 Because of its diminutive nature, scabiosa can even be a rock garden plant. The main chore with scabiosa is to cut off the spent flower stalks, which encourages them to bloom continuously. Otherwise, it's a just a matter of providing regular water. After they stop flowering in fall, cut the foliage back to about six inches and spread a fresh layer of mulch around the plants to prepare for winter. Every few years, it's helpful to divide established patches of scabiosa. Dig out six-inch clumps with a spade and transplant them to a new location. Fill in the holes left with fresh planting soil, so the remaining plants can grow into it. 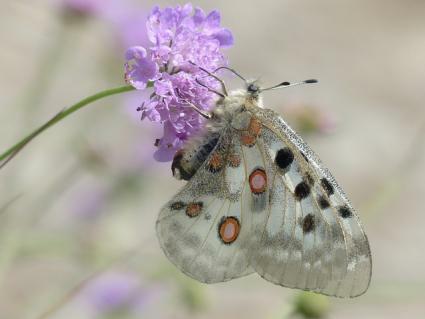 Scabiosa is virtually never bothered by pests or disease, except in the case of plants weak from being planted in too much shade or in an area with poor drainage. One of the many virtues of the plant is that it is even resistant to being browsed by deer. 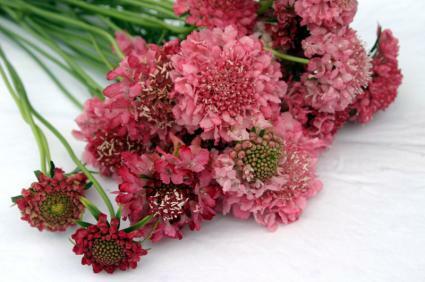 The differences among varieties of scabiosa are mainly a matter of flower. Fire King has crimson red flowers. Butterfly Blue is a popular sky blue variety. Pink Mist is a good choice if you're looking for a pink scabiosa. Miss Wilmott is a cultivar with white flowers. Perfecta has pale blue flowers with a white center. Black Knight has deep purple flowers that are almost black. With such a wide range of colors to choose from and virtually nothing to worry about in terms of pests and disease, it's hard to go wrong with scabiosa. They also make a long-lasting cut flower - a great way to show your feelings to someone special.